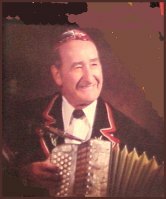 Preserve, perpetuate and nurture the Swiss traditions, heritage and culture that were brought to Monroe and Green County by its Swiss forebearers. Preserve and maintain the Turner Hall building as is appropriate and consistent with its status as a listing on the National and Wisconsin Registers of Historic Places. Oversee the use and operation of the Turner Hall building, with particular emphasis on and encouragement of those events, activities, etc. which support the promotion of Swiss heritage. Continue to offer the Turner Hall building as a venue for public events and meetings. In the mid-1800s, Swiss immigrants began arriving in south-central Wisconsin in search of a better life. The area's gently rolling hillside was very reminiscent of the immigrants' homeland. In 1845, 200 impoverished Swiss from the canton Glarus immigrated to what is now northern Green County and established a new settlement known as New Glarus. While New Glarus, which is about 15 miles north of Monroe, is the actual Swiss colony in Green County, large numbers of Swiss from primarily the German-speaking regions of Switzerland steadily continued to immigrate to all parts of Green County, particularly the Monroe area. 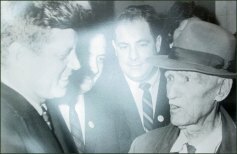 Although the last major wave of Swiss immigration to south-central Wisconsin ended in the 1950s, the influence of the Swiss throughout Green County is still strongly felt and seen yet today. In Monroe, one of the most visible and still viable evidences of the Swiss is the Turner Hall. 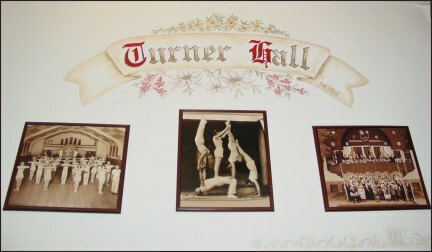 The Turner Hall derives its name from the German word for gymnast, which is Turner. The first Turnhalle was built by Swiss immigrants in 1868 on the same site as the current Turner Hall. 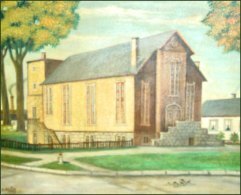 (Painting of the original structure at the right.) Originally a place for the Swiss to practice gymnastics and preserve their Swiss traditions, it also soon became a center of community activities and was often referred to as the "opera house". On Labor Day of 1936, the original structure burned to the ground. Almost immediately, plans were begun to build the present Turner Hall, which was designed by innovative German architect, Max Hanisch, and completed in 1938. The Turner Hall continues to be a vital place for nurturing Swiss heritage through its many Swiss-related events and activities, as well as a venue for concerts, dances, receptions, and a host of other community events. Long known for being a place Where Old and New Worlds Meet, legendary Swiss musicians such as the Moser Brothers, Rudy Burkhalter (pictured at left), Martha Bernet-Zumstein, Betty Kneubuehl Vetterli and Geni Good and his Glarner Oberkrainer have been well-known to Turner Hall audiences. Until recently, Turner Hall had been synonymous with the teaching, practicing and performing of gymnastics in Monroe. A Turner Hall gymnast, Marie (Blumer) Hoesly Herbert, competed in the 1952 Olympics in Helsinki, Finland. In recent years, the entire building...the authentic Old World Ratskeller, the beautiful upstairs grand hall and stage, the gym, and bowling lanes...has undergone loving renovation. Turner Hall's volunteers and sponsors work tirelessly to support and maintain this landmark gem and treasure of Swiss heritage. The newest of the four member organizations, the New World Swiss Club is an opportunity for anyone, regardless of ancestry, to support Turner Hall and Swiss heritage. Current activites include a monthly dinner event in the Ratskeller Restaurant, periodic updates and program discounts, and special rates for Grand Hall rentals. Click on the underlined name above for more information about the New World Swiss Club, including how to become a member. Established in 1963 with 19 immigrants, this mixed choir, which specializes in choral and instrumental Swiss folklore music, numbers over 40 singers, many of whom are native Swiss or descendents of Swiss immigrants to Green County. Turner Hall is the group's home and headquarters. For more information about the Monroe Swiss Singers, click on the underlined name above. This organization represents almost all of the area's cheese factories and cheesemakers, many of whom are descendents of immigrant Swiss who were Green County's early cheesemakers. Its milk testing lab is located at 1520 17th Street, Monroe. Formerly known as the Turn und Schwing Club, this is the group from which Turner Hall derives its name: Turner is the German word for gymnast. The Turners built the first Turner Hall in 1868 and have had a long history and association with Turner Hall in the teaching and practicing of gymnastics. The group's members are currently inactive. Like many non-profits, the challenge of meeting Turner Hall's financial needs and goals is on-going. Turner Hall depends largely on its membership and outside donations to survive. Not long ago, Turner Hall, which has been a fixture and landmark in southern Wisconsin since 1868, came uncomfortably close to no longer existing. As the only Turner Hall of Swiss origin left in the United States, that would have been a terrible loss. To that end, fund drives have taken place to ensure that the doors of Turner Hall will always remain open to the community and to those who embrace their Swiss roots, regardless of birthplace or residence. Gifts to the Turner Hall of Monroe are welcome at any time, and can even be part of your estate planning. Turner Hall currently has a Turner Hall Preservation Endowment Fund, which was established in 1999 and is administered through the Community Foundation of Southern Wisconsin. Along with other gifts and donations, a very generous gift in memory of Turner Hall member, Jack Kundert (September 10, 1931 - November 28, 2012), has provided seed money to set up a Turner Hall Foundation. Turner Hall of Monroe is an IRS 501(c)(3) Non-Profit and Wisconsin Chapter 181 Corporation, so all gifts are tax-deductible to the extent allowed by law.